When I was in France in September for an impromptu trip, I had about two days to spend in Paris. I’d never been there before, I didn’t speak the language, I had a lot of work I knew I’d be flying home to. I was happy and grateful but stressed. 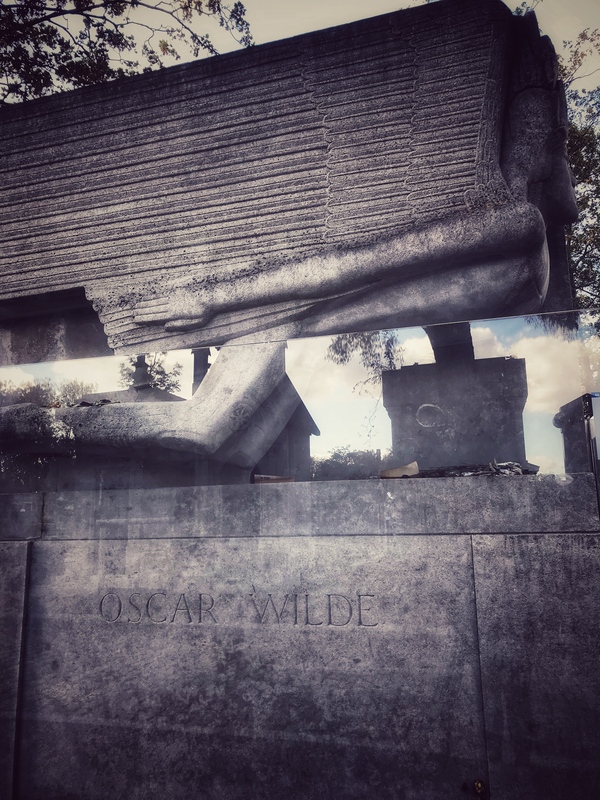 But there was one thing that I felt drawn to, the thing that I couldn’t leave Paris without doing: visiting the grave of Oscar Wilde in Père Lachaise Cemetery. It felt like a pilgrimage. I’m not a religious person. I probably couldn’t truly articulate what I believe. Energies, maybe. Ghosts. I don’t know. I’m not even a hard-core Oscar Wilde fan. But I needed to go there. I didn’t bring the right shoes for the amount of walking I’d been doing all week. My feet and legs ached. I got turned around a dozen times just finding the entrance of the cemetery. Once inside, I wandered for a long time, searching for the exact location of the grave. Père Lachaise is well organized but its long winding paths can play tricks on you. I could feel every cobble stone under my shoes. It was cold and I was hungry and I felt like I’d never find him. Obviously people make this trek all the time. I am not unique. Roses and gifts littered his grave. Lipstick marks covered the protective glass installed around the huge grave stone to combat graffiti from adoring fans. Tourists from England and Sweden and Germany paraded by in the half hour or so I spent there, sitting on the curb across the path from the grave. I felt almost embarrassed that I didn’t have a flower to offer. He probably hated that. Instead, I sat there and asked him questions. How did you do it? How did you have the confidence? I thought about the tragic way his life was cut short. And felt silly for asking him anything, since anything I had experienced is nothing compared to his life. But still, I admitted to him, that while I don’t deserve it, I’d sure like this advice. Can I do this? This writer thing? I feel silly saying I did this. But it was a pilgrimage to connect to something deeper, some sort of literary history, to figure out if I’m crazy for doing what I’m doing, for wanting what I think I want. I think it is important to find stillness and ask these questions. To a god, to a literary giant, to someone you’ve lost, to yourself. You’ll get an answer if you ask the question. It may not come in the form of words and a life plan, but in the form of a warmness, a feeling in the pit of your stomach, a sudden lightness in your breathe, in your step. I made my way out of the cemetery, but it wasn’t easy. I was pretty convinced the ghosts wanted to try to keep me there, confusing me, sending me down more painful cobblestone paths to drain me. But then I found the opening. I spent the rest of the night wandering more streets, eating cheese, reading, and drinking hot chocolate. And felt like myself. And at peace with that feeling. We’re getting close to the new year. I’m watching friends and family achieve things, get married, have babies, buy houses. Lovely choices and happiness in so many forms. Seeing others’ choice can sometimes make you question your own. So make your own pilgrimage. Maybe not to Oscar Wilde’s grave (if you do, bring shoes that can deal with those cobblestones) but to a place with the energy that will help you focus and ask that question that’s burning in your mind. And then listen for the answer.